After Nokia recently announced the Nokia N810 Tablet, it has now started shipping the device in the United States. The Nokia N810 Tablet is an upgrade from the previous Nokia N800. 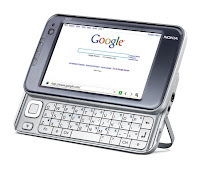 The Nokia N810 Tablet now features a slide out QWERTY keyboard. The Nokia N810 Tablet also features a built-in GPS, VoIP and Wi-Fi capabilities. AThe Nokia N810 Tablet uses a Mozilla-based browser (Let's just hope it works just as good as the Safari browser on the iPhone)and can playback music and videos. The Nokia N810 Tablet has a built in 2GB of memory and can be expanded through a memory card. My only qualms about the device is that it's only running on a 400 MHz processor, almost the same processor as my Dopod D810. I don't know how the processor would work with the Linux operating system, but let's just hope that the Nokia N810 Tablet doesn't experience any hanging issues.